Low prices. OrangeSmile.com offers car hire service in Australia on the lowest-rate-guarantee basis, since we work with car suppliers directly. For your search criteria in Australia, we always select and show the best rental offers. The car reservation process consists of 3 simple steps: (1) search for available cars for your dates in Australia; (2) select your car type; and (3) fill in the booking forms. Once the reservation is completed, you will receive a confirmation voucher to your email address. During the booking process, please check your rental conditions. To pick up your car at the rental point in Australia, you need to provide our confirmation voucher, your driving license and a valid credit card. The final payment is normally carried out at the pick-up point. Our car hire points in Australia accept VISA, MasterCard, etc - please check your rental conditions. At the pick-up point, please read the handling manual and check the car for present defects. OrangeSmile.com wishes you a pleasant journey to Australia! The car hire reservation system OrangeSmile.com allows renting a vehicle in Australia within 10 minutes. Our largest database of car suppliers enables us to provide you a rental car in Australia at the cheapest rate ever possible. At rental locations in Australia we offer the following car sizes: mini, compact, economy, standard, premium and luxury. The following car types are available in Australia: Sedan, Hatchback, Jeep, Cabriolet, Coupe, Minivan and Minibus. 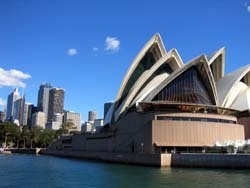 The best way to start exploration of Australia is to visit Sydney – the most beautiful and matchless city of the country. You will find old quarters, modern business districts and shopping streets there. Tourists, who wish to see historical buildings, churches and monuments, should start with King Cross district. Narrow streets and beautiful squares of King Cross are home to art centers, museums and souvenir outlets. Elizabeth Street is a popular destination for shopping, and Homebush quarter, which is located nearby, is the location of Olympic sports facilities. The most popular cultural places of interest in Sydney include Sydney Museum of History and Anthropology, National Marine Museum, Memorial Art Gallery, the Museum of Applied Arts and Science, Art Gallery of New South Wales, Nicolson Antique Museum and Modern Art Museum. There are also several parks and reserves in the city, the most popular of which are Hyde Park and Park of Wild Animals of Australia. In Sydney, tourists can attend a very unusual excursion – a visit to the opal manufacture. Here visitors will see how the rock is processed, learn more interesting information about these precious stones and, of course, purchase the jewelry. Perth is another Australian city that is worth attention. It is mostly famous for its numerous mines that quarry gold, diamonds and nickel. Perth is a wonderful place with typical Australian landscapes – high rocks, unusual trees and numerous exotic plants. Darwin is a city that hides many interesting places and surprises. The main attraction here is Kakadu National Park, where visitors can see rare animals, birds and enjoy variety of local flora. There are a few more parks in Darwin suburbs, the most popular of which are Katherine Caves and Leechfield. Without a doubt, Big Barrier Reef is the main symbol of the country and one of most famous places in the world. The reef is stretched along the east coast of the country. Big Barrier Reef is the biggest in the world and is added to the list of UNO World Heritage sites. The length of the reef is 50 kilometers. Every year this unique place attracts many divers, who deeply admire the beauty of the reef. Divers are also recommended to visit Magnetic Island, where they will find spectacular wild nature. If you need a rare type of vehicle in Australia (a roadster or a limousine), we advise to look for it at airports and railway office locations, as they offer wider choice of vehicles. If you have faced the situation when a rental office refuses to provide you with the services indicated in the voucher - call us using the phone number from the voucher.